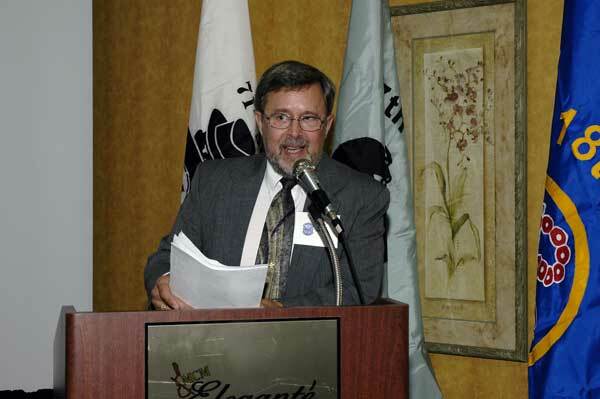 AC-119 Gunship Association President for 2006 Wayne Laessig was also Master of Ceremonies at the Saturday evening banquet. Wayne was a pilot in the 18th SOS. 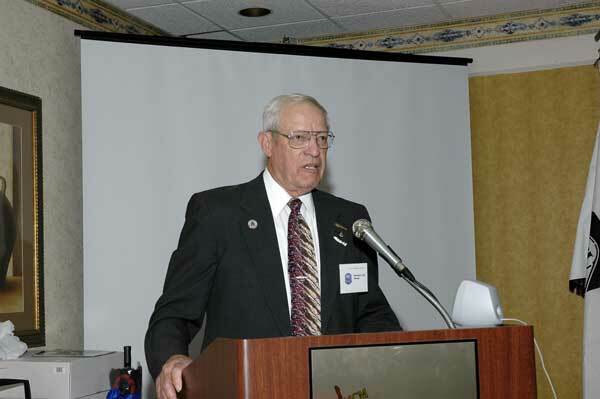 The title of the evening's program "The 71st, Then and Now" featured our own Al Heuss of the Vietnam era 71st SOS and the current commander of the new 71st SOS, Lt. Col. Jim Cardoso. 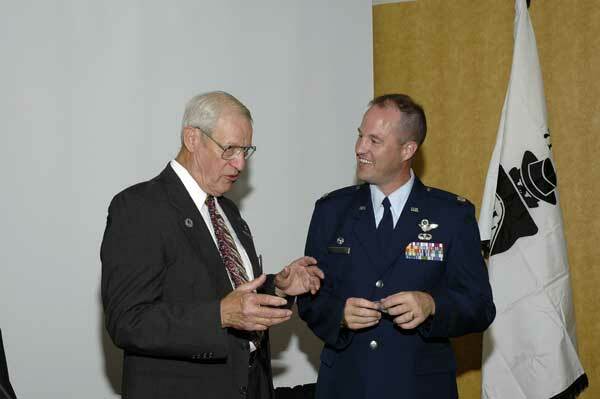 The two Colonels presented their perspectives on preparing squadrons for combat situations - 1968-69 vs. 2006-07. Their presentations were very informative and enlightening. 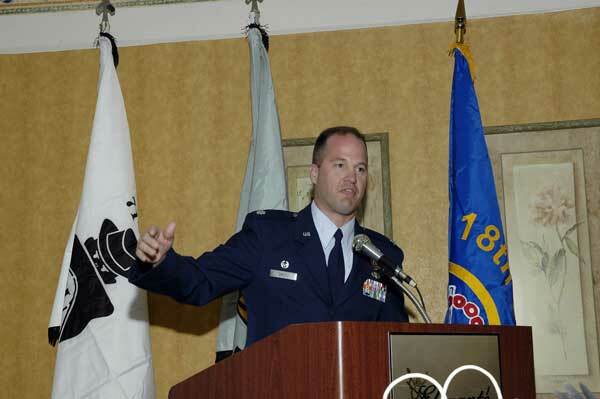 Lt. Col. Jim Cardoso used gestures and humor to describe the challenges he has faced in bringing a brand new squadron and aircraft up to speed. He and his staff are literally 'writing the book' on the operational and performance characteristics of the new CV-22 as they go through the learning process. The new 71st SOS is a training squadron for the CV-22 for the rest of the Air Force. they will be training flight crew and maintenamce personnel as the aircraft is placed into active service. Colonels Heuss and Cardoso share their experiences. 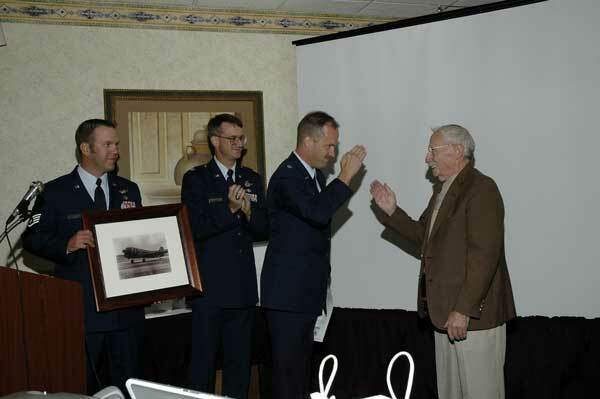 Lt. Col. Jim Cardoso completes a salute to WW II 71st Troop Carrier Squadron pilot Marvin Litke for his service to the United States. Marvin presented his personal framed photograph of the C-47 he flew in WW II to the new 71st SOS. The photograph will be displayed in the 71st Heritage Room with other memorabilia items. AC-119 Gunship Association Officers and support staff for 2006-07. 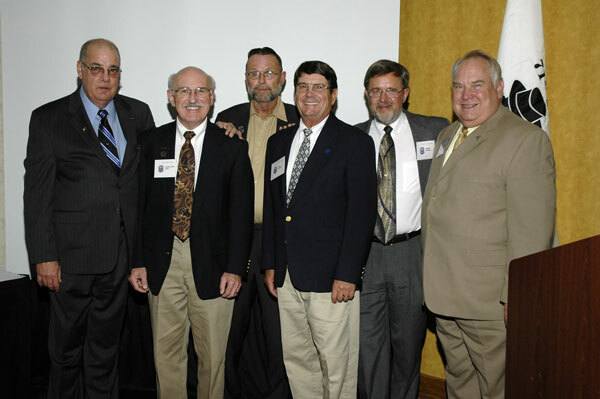 (L to R) Ray Barradale, Presidet; Jim Alvis, Secretary; Doug Wohlgamuth, Treasurer; Vern Hansen, Vice-President; Wayne Laessig, Past President; and Rogers Stevens, Newsletter Editor.